Imperceptible have been the changes at London Fashion Week Men’s with the decampments of mega-brands like Burberry, Tom Ford, Moschino. The four-day event has held its own in the absence of those brands. In fact, the spotlight is where it should be when in London—on the emerging labels. Lulu Kennedy, founder of Fashion East and MAN, curated a lineup of rising menswear stars for her Spring 2018 MAN group show. Per Götesson, Art School and Rottingdean Bazaar’s presence electrified day two of proceedings, and the laudatory response that permeated the Old Truman Brewery cemented the show’s success. 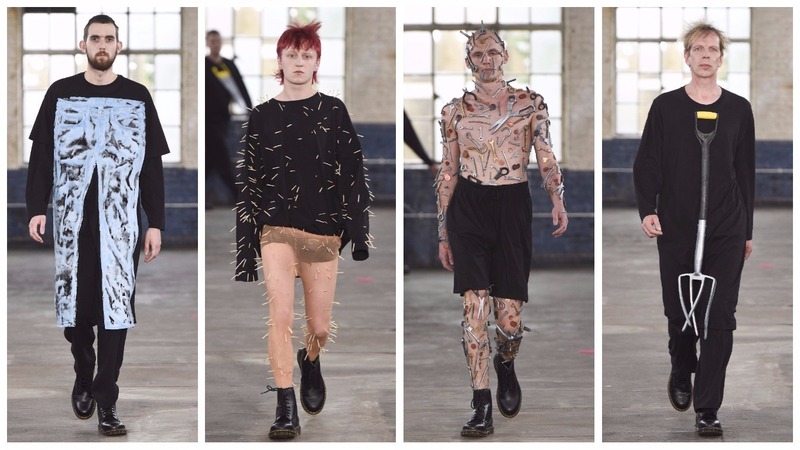 Swedish designer Per Götesson completed his MA in Fashion at the Royal College of Art last June and the following day he presented his first collection as part of the MAN initiative. This was his third and final outing; he made the decision up the ante and focus on producing a more mature, commercially viable output that doesn’t deter from his distinctive aesthetic. He furthered his study into gender, silhouette, proportion and cut. What’s interesting about the four tenets to his work are how informative they are to fashion as a whole: gender, silhouette, proportion and cut are the basis on which fashion design is built. Designers interact with all four in order to produce a collection but it’s the impetus for Götesson. Denim was drastically disproportionate; skimpy fishnet tops contrasted wildly with billowing pink trousers which could effectively house two wearers, a leg for each. His exploration of gender is marked firstly by colour studies. He took bubblegum, dusty rose, pale lemon and juxtaposed them nicely with traditionally masculine hues of black and blue. Secondly, he processes gender ambiguity and androgyny with his model selection before, thirdly, messing with the silhouette. All four components are present in his show but the interplay between them isn’t always impactful. Götesson, unlike many others, makes the sole focus of his shows those four and one can’t help but wish he’d strive for more. Eden Loweth and Tom Barratt of design collective Art School emerged firstly in January 2017 when they featured in the Fashion East presentations at London Fashion Week Men’s. They presented their clothing untraditionally, by means of a sprawling dance routine. Nothing about them is traditional—they stand for the opposite. Gender, race, ethnicity, religion, sexuality is cast out the window to allow this breeding ground of difference to flourish. 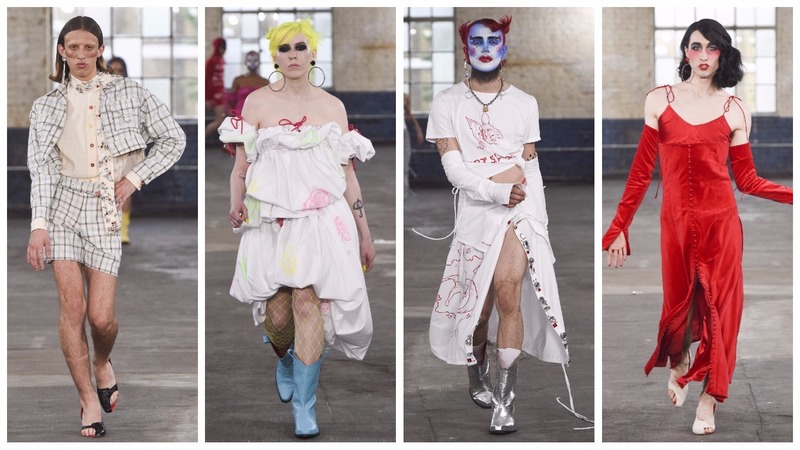 Predominately, the duo are looking at queer culture and the most effective manner in which to express that to the fashion crowd. Thus far, they have endeavoured to flavour their presentations with fun and energy certainly emanates from all four walls of the show space. It opened with a rose-printed evening gown which was a fine start to the show—it proposed an idea of glamour and from afar it was traditional… it was worn by a male model in beautifully exact makeup. The show’s opening was extrapolated, into something informed by the 90s. There were cowboy boots, jewel accents, mini dresses and power suiting. 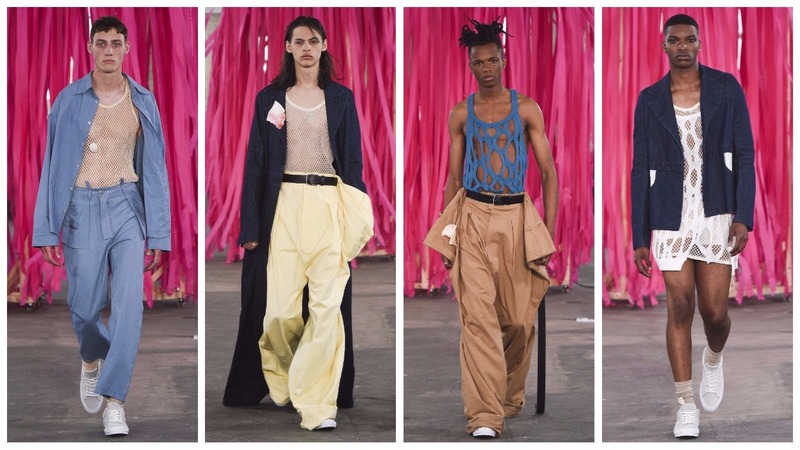 The loucheness of the 90s club scene began to unfold on the catwalk. An explosive final walk to the Macarena delighted the audience. Despite the entertainment factor, the clothes do not maintain the interest as much as the characters that inhabit them do. A face covered entirely in glitter? A bottle green bob? Hairy legs in a plaid mini skirt? A man dresses in a skimpy red dress and heels? Rarely do the clothes speak louder than the models. In terms of Instagram likes and social media success they are ahead of the game but in the context of commercial viability, this brand runs risk of dying young if they don’t either match the flamboyancy of their models of if they don’t design powerful clothes that won’t require a model to breathe life into them. Rottingdean Bazaar were the final label to present under the umbrella. James Theseus Buck and Luke Brooks have carved themselves a place in London. They have championed comedy in fashion. Although their work might imply low skill, the way they flatten and apply everyday objects to garments is rather complex. For Spring 2018 it was workman trousers, balloons, cans, hammers, copper coins, matchsticks and saws. From head to toe, one model was decorated with miscellaneous garden tools. The last thing one wants is for the naysayers to be validated: it would be unfortunate for something like Rottingdean Bazaar and its lightheartedness to stand for frivolity in fashion. If anything, Rottingdean Bazaar is akin to a movement such as pop art, in which everyday objects are present as works of art—the vulgarity of the objects symbolising a sociological study, an assessment of contemporary culture. However, to read into fashion requires a level of thought many don’t elect to engage with. To this critic, Rottingdean Bazaar does what it does best but when will it be time to progress?